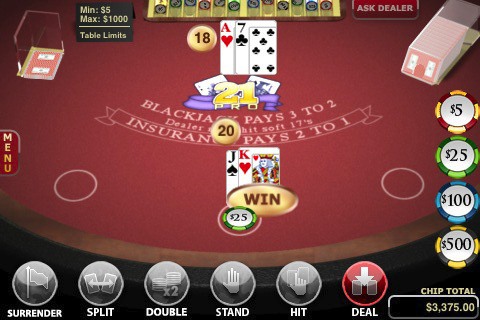 With the 21 Pro Blackjack fresh AIR app, you can play blackjack from your iphone. And you do not need to be a master card counter as the features available in the latest version 1.1.0 include 'Ask the Dealer'. This way if you are a beginner the dealer will tell you about pair splitting, doubling down, taking insurance, surrendering and hitting. Or if you are an advanced blackjack player you can use the app to develop your skills at strategy and learn card counting methods such as hi/lo counting and KO counting. You can practice with or without the display of the current count. In this version of the game you can split your hand up to three times and end up playing four hands simultaneously at most. The graphics are excellent and you will really get the feeling to be sitting at a casino in Las Vegas or Monte Carlo with the added benefit of being able to configure this blackjack game to your level of play. As online casinos including the mobile versions are getting more and more popular, this application is a good way to improve your playing skill at not cost. As 21 Pro Blackjack does not involve wagering real money, just playing money for the fun. Nevertheless this game is rated 12+ given that it involves frequent and intense gambling. Use with moderation and avoid letting your children play that. The first version of 21 Pro Blackjack was released in 2008 by Avallinx, LLC, a software company run by blackjack and online gaming enthusiasts. Visit the itunes website for downloading the 21 pro blackjack application here.